Many assumed today that when world time trial champion Tony Martin (Omega Pharma-QuickStep) rolled down the Tour de France prologue start ramp that he’d be wearing yellow by the end of the race — or at least finish within hundreds of a second of yellow. Instead a tire puncture forced him to switch bikes mid-race, adding about what some commentators estimated as 20 seconds to his time. Conversely Fabian Cancellara (RadioShack Nissan Trek) rode a flawless, uneventful prologue, and he won. One man’s misfortune became another’s fortune. 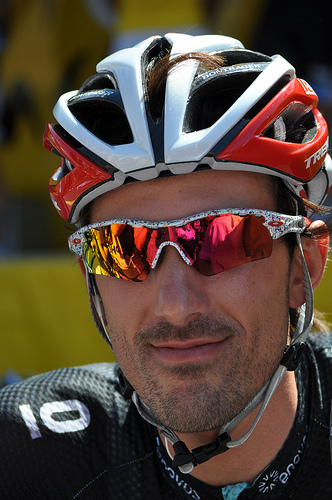 With one of his primary competitors out of the running to win, Cancellara’s odds increased due to no action of his own. It reminds me of Andy Schleck’s dropped chain in the 2010 TDF. Some called it bad luck. Others called it poor shifting technique as it’s common knowledge that certain gear combinations can cause dropped chains. Was Martin’s “bad luck” the result of something he did, or an imperfect tire job, for example? Mechanics will hate me for mentioning that. They’ll stay up all night before a race to make sure the equipment is perfect. We like to believe the strongest man or woman wins. That includes not only physical strength, but mental and tactical strength, as well as excellent preparation in equipment, nutrition, and course review. But it struck me today that regardless of strength and preparation, luck seems to play a role in the outcome of every bike race. It feels too fatalistic a perspective for me as a person who was brought up to believe hard work brings success. « Peter Sagan’s guardian angel?